Charles Dickens would have understood teenager James Alfred Davis and his plight perfectly, just as he comprehended Old Marley’s spectral meanderings. Alfred and Marley both necessarily were dead. Dickens’ A Christmas Carol required that plot understanding. So does the story we are about to tell in The Vault’s—only ours it more of A Halloween Carol. James Alfred Davis was also dead. Family folklore, Army records, and data in The Vault confirm that. But he did not look dead on April 17, 1862, as Barrington’s spring dusk gathered. 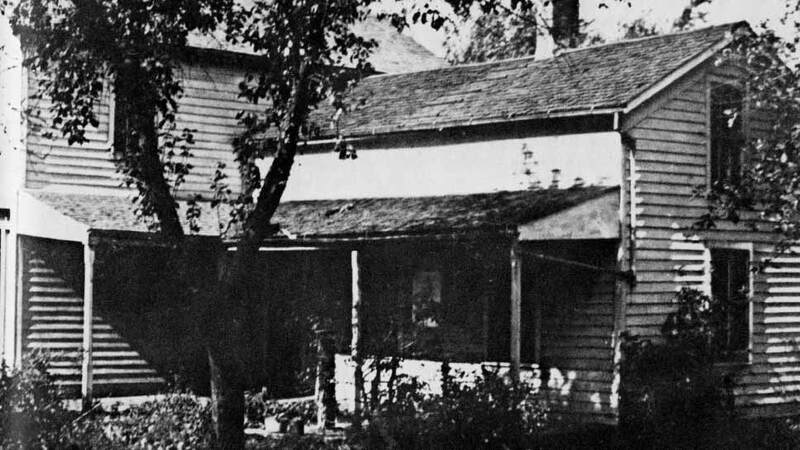 Davis stood that late afternoon on his family’s front porch at their Franklin Street home. He was quite lively for being a phantasm. As the family story reiterated for a century, he paced the porch’s wooden planks with loud enough force that all inside heard him. Scientific proof? Sorry. Time has consumed all who heard the footsteps or the story from its originators. Alfred’s mom, Parintha Lawrence Davis, first saw him on the porch through the front-window curtains, called out joyfully to her husband that her beloved Alfred was home, and then ran to the front door to greet him. 9-year-old Herbert joined them. Mom opened the door. Alfred wasn’t there. He had vanished, as if he had been a … well, yes … a ghost, because, he was, as Dickens might have foretold. He was there, and not there, because Alfred unequivocally was deceased at that very moment. Ghosts tend to be unreliable visitors, but that’s all necessary for a Dickensian meme. Parintha’s boy had run off to join the Army and broken her heart, but now he was home. Mom had needed that reunion, and maybe James Alfred did, too. He seemed superficially to be the same kid who skedaddled with Barrington neighborhood chum Franklin Applebee. They were 17, but fibbed their way into Lincoln’s Army in Chicago. Playing hooky by fighting rebels with Company C of the 19th Illinois Volunteer Regiment certainly seemed more appealing to Alfred than being drafted to till dad’s Wauconda township farm. But Alfred was fundamentality different that day. Though he walked the Earth, he was a Marley-style apparition. The tale has been retold faithfully for a century. First, Barrington author and historian Cynthia Baker Sharp’s 1976 bicentennial book Tales of Old Barrington solicited the specifics from Californian Donald McDowell, grandson of Herbert Benton Davis. Herbert was the last of the family’s six Civil War sons and the only one who did not enlist. He was 9 when the war broke out. Herbert was there that afternoon when James Alfred materialized. “Grandpa said it happened, and grandpa never lied,” McDowell told Sharp. There was no provocation or motive for Mom and Dad to concoct a non-corporeal homecoming that evening, and thereby throw themselves into a profound, perturbed tizzy. On that evening, they did not know young James Alfred was indeed dead. But then a letter arrived from his commanding officer several weeks later. 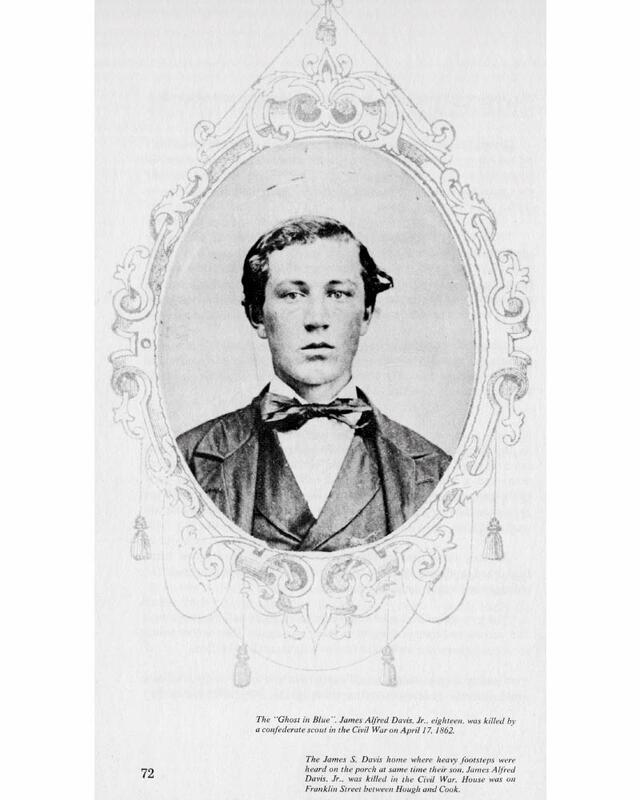 On that very April 17 morning, young James Alfred was shot by a Confederate sniper. He died before dusk. Wrote Captain J.W. Guthrie to the Davises: “I regret to inform you that on April 17 your son, Private James Alfred Davis, was shot and killed by a Confederate scout while on picket duty just east of Tuscumbia, Alabama.” U.S. Army records confirm Alfred died at the regimental hospital the same day he was shot. And very shortly, he was dead. In all, five Davis boys fought in the Civil War: James Alfred (19th Illinois), George L. Davis (15th Illinois Cavalry), Anton C. Davis (15th Illinois Cavalry), Luther W. Davis (52nd Illinois Infantry), and Charles B. Davis (32nd Illinois Infantry). Just six weeks after Alfred’s death, the Davis’s next oldest son, Anson, died at Monterey, Tennessee. Another died as a POW. Parintha Davis died in 1898 at age 92 in Iowa, but to the end she never ceased insisting she had seen her son. Maybe he came home to wish farewell to her, but that’s all the ethereal energy he could muster. That would be a Dickensian plot flourish. It was enough for Mom. It had to be. She never saw her beloved James Alfred again. Have a great historical Barrington tale to tell? Send your ideas for The Vault to [email protected].